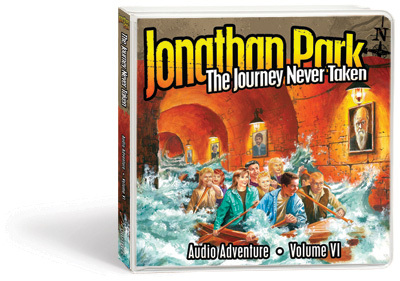 Vision Forum proudly presents America’s only nationally syndicated creation radio drama — Jonathan Park. Originally developed by the Institute for Creation Research, but now under the management of Vision Forum. This action packed, professional-quality radio drama is hosted in seven countries around the world and broadcast on hundreds of radio station outlets, captivating listeners of all ages, and teaching the truth of biblical, six-day creation. Each adventure is based on real places and scientific discoveries! Dr. Kendall Park and his family are trapped inside the Hidden Cave and must fight for survival! Meanwhile, the credit for Dr. Parks fossil discovery, which earlier had cost him his job, is being claimed by an old friend. The Brenan and Park families are spending a fun weekend on the Buchanans dude ranch. Unfortunately, Dillon Buchanan has a chip on his shoulder and his mean pranks put Jonathans life in danger! A dangerous arsonist escapes from the Sheriff near Brenan Ranch. Suddenly, a homeless man shows up at the museum construction site and offers his help. Is this mysterious stranger the escaped arsonist? Jessie is filled with excitement when Bonnie gives her "Dusty," the tan Appaloosa. But when Bonnie, Jessie, Martha, and Katie take the one thousand-mile, all-girls road trip to get the horse back home, everything seems to go wrong! After a diabetic episode, eight-year-old Ashley awakes to find herself locked inside a strange room with only a computer. The Eagle’s Nest Gang receives her stray e-mail, and not it‘s up to them to find her before her blood-sugar drops too low again! Artist Riley Sievers is helping Benjamin work on an invention when suddenly, he disappears! While police suspect Riley’s kidnapping is connected to his father’s campaign for Governor, the Eagle’s Nest Gang search for Riley and the truth. When Rusty plays an elaborate prank that backfires, he and the Park and Brenan families are stuck in a big, scary mansion that holds secrets about the strange disappearance of Elizabeth McBane in 1902! Days before the grand opening celebration for the museum, the Parks are being framed for a crime they didn’t commit. Meanwhile, the museum is being threatened by an environmental group that could force them to close the doors before they ever open! 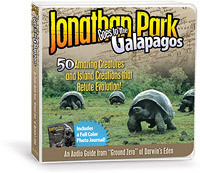 Each set of CDs comes with a 75 page Study Guide designed to strengthen your familys understanding of the scientific and biblical lessons taught in the Jonathan Park series. Click on the links below to review a related product.